The foods we eat can affect how we feel, and not just in terms of whether or not we feel satiated. Certain nutrients can help guide our emotions and can even help reduce symptoms of anxiety. 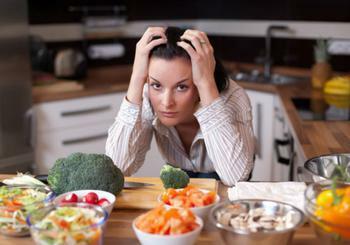 According to Dr. Uma Naidoo of Harvard Health, anxiety and depression sufferers may benefit from certain diet tweaks. Therapy and medications can help relieve the burden of anxiety, but Naidoo asserts that diet is also important. “In addition to healthy guidelines such as eating a balanced diet, drinking enough water to stay hydrated, and limiting or avoiding alcohol and caffeine, there are many dietary considerations that can help relieve anxiety,” writes Naidoo, adding that it’s also important not to skip meals. She attributes the anxiety-alleviating effects of eating the right foods at the right time to even blood sugar levels, which can create a calmer state. Complex carbohydrates found in grains, fruits, and vegetables are metabolized more slowly and help keep blood sugar steady -- much better for the mood than the simple carbohydrates found in processed foods. So what foods have been shown to reduce anxiety? Magnesium. In a study, mice with diets low in magnesium showed an increase in anxiety-related behaviors. Therefore, explains Naidoo, foods rich in magnesium -- such as leafy greens, nuts, and whole grains -- may help a person feel calmer. Zinc. Zinc-laden foods have also been linked to lowered anxiety. Oysters, cashews, egg yolks, and beef are just a few examples of foods rich in zinc. Fish. Omega-3 fatty acids have previously been linked to improving symptoms of depression, but a 2011 study found that they may also help reduce anxiety. Omega-3 supplements are available, but can also be found in fatty fish such as wild Alaskan salmon. Sauerkraut. A recent study published in Psychiatry Research suggested that probiotic foods like sauerkraut, kefir, and pickles could lower social anxiety. Avocados and almonds. Foods packed with B vitamins, such as avocados and almonds, release neurotransmitters like serotonin and dopamine. Antioxidants. Anxiety is said to be associated with a lowered antioxidant state, so eating antioxidant-rich foods may help reduce those feelings. Beans, fruits, nuts, berries, vegetables, and some spices (such as turmeric and ginger) are some of the foods that boast high levels of antioxidants. Just how good is “good” cholesterol?